Giovanni Caboto (c. 1450 – c. 1499), known in English as John Cabot, was an Italian navigator and explorer commonly credited as the first early modern European to discover the North American mainland in 1497. Cabot's use of Celtic legend confirms that there was pre-Columbian contact between North Europe and North America, perhaps Celts from Ireland as well as Vikings from Scandinavia crossed the Atlantic Ocean. 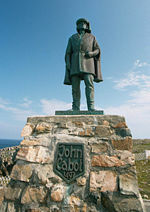 Between 1496 and 1497 John Cabot established England's first overseas colony—a fishing settlement—in Newfoundland, which Cabot claimed on behalf of Henry VII of England. This was the beginning of Britain's overseas empire, which was to become the largest in history. Following the loss of the last English possessions on the European continent by Henry VII's successors, England looked elsewhere for colonial expansion. North America, building on the foothold that Cabot had established, became one of England's main imperial interests. Thirteen of Britain's North American colonies later emerged as the United States, an English-speaking nation. There is no doubt that England's sea-faring people would have traversed the globe whether Cabot had or had not pioneered the North Atlantic crossing. However, Cabot was the first to pioneer this route, so his name deserves an honorable mention in any account of how a small island nation embarked on the enterprise of acquiring a vast, inter-continental empire. Cabot's modest colony was the humble beginning of a global enterprise. The British imperial project was no doubt a mixed blessing, if not a curse, for those who found themselves subject to British rule. Yet wherever they went, the British would promulgate awareness of such values as freedom, human dignity and equality, which enabled millions of people to become aware of belonging to a larger world and to a single human family. Cabot's own Italian origin is an example of how a man from a different nation can make a major contribution to the destiny of another, one that in this instance arguable left a lasting imprint on the course of world history. If England had not started North American colonies, the United States would not have been born, and the trans-Atlantic alliance that proved crucial in winning two world wars may not have existed, or it could have been one tied to a different European nation, perhaps one on the opposite side of these conflicts. Cabot was born in 1451 (the exact date and place of birth are uncertain) in Genoa, Gaeta, or Chioggia (this is also uncertain). In his youth he moved to Venice and became a Venetian citizen. Like other Italian explorers of the era, such as Christopher Columbus (Cristoforo Colombo), Cabot made another country his base of operations. For Cabot it was England, so his explorations were made under the English flag. The voyage that saw him and his crew discover the North American mainland—the first Europeans known to do so since the Vikings—took place in 1497, five years after Columbus' discovery of the Caribbean. Again, like Columbus, Cabot's intention had been to find a westerly sea route to Asia. It was probably on hearing of Columbus's discovery of 'the Indies' that he decided to find a route to the west for himself. He went with his plans to England, because he incorrectly thought spices were coming from northern Asia; and a degree of longitude is shorter the further one is from the equator, so the voyage from western Europe to eastern Asia would be shorter at higher latitudes. full and free authoritie, leave, and power, to sayle to all partes, countreys, a see as, of the East, of the West, and of the North, under our banners and ensignes, with five ships ... and as many mariners or men as they will have in saide ships, upon their own proper costes and charges, to seeke out, discover, and finde, whatsoever iles, countreyes, regions or provinces of the heathen and infidelles, whatsoever they bee, and in what part of the world soever they be, whiche before this time have beene unknowen to all Christians. 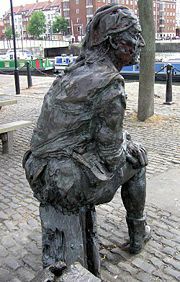 Cabot went to Bristol to make the preparations for his voyage. Bristol was the second-largest seaport in England, and during the years from 1480 onwards several expeditions had been sent out to look for Hy-Brazil, an island that would lie somewhere in the Atlantic Ocean according to Celtic legends. Some people think Newfoundland may have been found on one of these voyages. 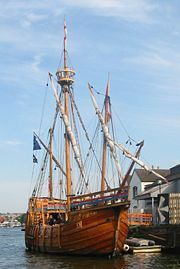 In 1496 Cabot started out from Bristol with one ship. But he got no further than Iceland and was forced to return because of disputes with the crew. On a second voyage Cabot again used only one ship, the Matthew, a small ship (50 tons), but fast and able with 18 crew. He departed either May 2 or May 20, 1497 and sailed to Dursey Head, Ireland, from where he sailed due west to Asia—or so he thought. He landed on the coast of Newfoundland on June 24, 1497. His precise landing-place is a matter of much controversy, either Bonavista or St. John's. He went ashore to take possession of the land, and explored the coast for some time, probably departing on July 20. On the homeward voyage his sailors thought they were going too far north, so Cabot sailed a more southerly course, reaching Brittany instead of England and on August 6 arrived back in Bristol. The location of Cabot's first landfall is still unknown, because of lack of evidence. Many experts think it was on Cape Bonavista, Newfoundland, but others look for it in Cape Breton Island, Nova Scotia, Labrador, or Maine. 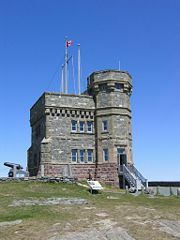 Cape Bonavista, however, is the location recognized by the governments of Canada and the United Kingdom as being Cabot's official landing. His men may have been the first Europeans on either American continent since the Vikings: Christopher Columbus did not find the mainland until his third voyage, in 1498, and letters referring to a voyage by Amerigo Vespucci in 1497 are generally believed to have been forgeries or fabrications. Back in England, Cabot was made an admiral, rewarded with £10 and a patent was written for a new voyage. Later, a pension of £20 a year was granted him. The next year, 1498, he departed again, with 5 ships this time. The expedition made for an Irish port, because of distress. Except for one ship, John Cabot and his expedition were never heard from again. John's son Sebastian Cabot later made a voyage to North America, looking for the Northwest Passage (1508), and one to repeat Magellan's voyage around the world, which ended up looking for silver along the Río de la Plata (1525-1528). In 1498-1500, a few Portuguese travelers, Miguel Corte-Real and Gaspar Corte-Real being the most famous participants, visited Greenland, Labrador and Newfoundland. In 1501-1505 an English syndicate, consisting of 3 Azoreans and 2 English traders, made voyages to Newfoundland. From 1504, if not before, Breton, Basque Portuguese and English fishermen crossed the ocean to catch fish on the Newfoundland banks. Cabot is remembered in Bristol by the Cabot Tower, a 30-meter tall red sandstone tower of 1897 (the 400th anniversary of the landing) on Brandon Hill near the city center, by a replica of the Matthew built in the city and by a statue of the explorer on the harborside. This article incorporates material from http://www.win.tue.nl/~engels/discovery/cabot.html. Copied with permission. All links retrieved May 14, 2018. This page was last modified on 14 May 2018, at 20:32.